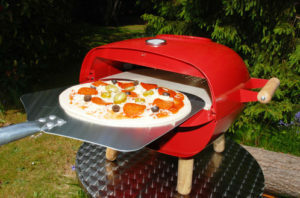 We can’t get enough of the Firepod Pizza Oven. Possibly, one of the best outdoor and indoor gas-fired pizza ovens available on the market – you can finally become a domestic pizza making professional with its three ingenious built-in uses. Fortunately, you can bring the Firepod anywhere you go, from friend’s houses to countries abroad. The Firepod’s remarkable performance provides endless shapes, sizes and combinations for your pizza, from soft to extra crunchy with stuffed crust. Just in case you’re image-conscious when it comes to your outdoor appliance, it’s available in several retro colours to add more diversity to your outdoor kitchen. Not only can you make Pizzas, but this affordable pizza oven has a built in BBQ griddle meaning you can also cook pretty much any meal. 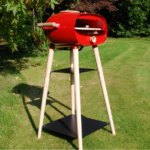 This outdoor pizza oven and portable grill is gas fuelled which eliminates the chore of cleaning out embers, or renewing your wood fuel supply. Additionally, you receive a pizza stone, a peel, a cover and heat proof gloves for safety. The kit comes with a four-legged stand called the ‘Quadpod’ which gives you the option to have it as a standalone unit. Alternatively you can remove the base and place it on a suitable surface, making this a truly portable unit. This compact oven has a quirky modern style, and the the oak stand nicely complements the glossy finish. The pizza oven measures 45 x 54 x 39cm in dimension (without the Quadpod) and only weighs a light 25kg meaning you are easily able to transport around if you want to – perfect for campers! When assembled with the stand, the whole unit stands at 105cm tall. A key selling point of this Firepod pizza oven kit which outshines any other for us is the price – the value for money is fantastic and incomparable to other pizza stoves already on the market. It is a superb buy for any first-time pizza oven buyer who wants to buy a pizza oven for their household, whether it’s outside or in the kitchen. The installation process for this outdoor pizza oven kit is pretty straightforward. The great thing with the Firepod Pizza Oven is that it is delivered already built for you, all you need to do is add the stand (and even that’s optional). The installation and build when buying a pizza oven can often be a huge turn off as they can sometimes seem over complicated, however with the Firepod the hard work has already been done for you.